Do you know her, too? The mom who other moms like to orbit because of her amazing planning skills? And no matter how hard you try to plan, you feel like an aimless shooting star flying through space? Truly, you’re not alone; I can surely attest to that. I dubbed myself the “anti-planner” many years ago. But with the end of high school looming near (Ben is in his first year of two to complete his senior year), I have had to do more planning and record-keeping than in the past. Spending some time figuring out how to mesh my anti-planning personality with Ben’s best interests has admittedly been a challenge, but I’ve learned a few things along the way. So, in the interest of helping other anti-planners out there, here are some homeschool planning tips to help you function well within your own orbit. They may even help you shine brightly. Indeed, just like the stars, people differ from each other. And this is a good thing! So, when you’re planning, there aren’t any comparisons, especially with those overzealous planning addicts out there. Now that we have this established, let’s get down to the details. With this in mind, we could take the principle of how color is in relation to stars and apply it to planning. As you prioritize appointments, tasks, etc., you could easily start with the most important to the least important. So, the most important can be highlighted in blue. And then go down the scale of colors to yellow, orange, and then red. Since white is kind of hard to highlight, we’ll skip that. Of course, you could draw a box with a white middle around the words I suppose. But that’ll be up to you. To be sure, lights are divided into lists: the sun, moon, and stars by name and constellations! Isn’t it wonderful to have such an orderly Heavenly Father to emulate? Once you have your main list sorted, it’s time to break it down into daily, weekly and monthly priorities. You can easily indicate monthly priorities on your list by drawing a little star next to each. Home. For this, you can easily list out the regular responsibilities. But you can also plan on some emergent things having to be jotted in as they happen. Homeschool Co-ops. Grant it, this isn’t for everyone. However, if you’re involved in one, you have to keep track of assignments, etc. Homeschool Lessons. From lesson plans to tracking lessons, correcting lessons, and even ordering curriculum, it’s important to have them scheduled. Kids. Naturally, this includes appointments, activities, outings and the like. Parents. If you need a reminder, you and your spouse are a couple. Or if you’re a single parent, connect with other single parent friends for a time of fellowship. Self. This is a must. Self-care is a must. Work. If you’re working on top of it all, you naturally need to schedule in your hours. Naturally, not everything runs smoothly and you have to adjust. I mean, asteroids can fall to earth and put a bit of a dent in things. But see this is where correction tape comes in handy. I know it’s not the prettiest solution, but it works. Or else there are those fabulous erasable Frixion pens that come in a plethora of colors. Simply erase what didn’t get done and reschedule it. Yes? I’m still here. I know, it’s a lot to keep track of in one planner. Plus, there are often times notes that we need to jot down alongside everything we schedule. And, it’s a ton of paper to keep in a notebook. Or it’s a super big bound planner you have to lug around everywhere. But this is where some students start to keep their own planners. And where some families will keep a family calendar on the wall as a central location for everyone to stay on top of things. Then during family meetings, everyone goes over the week and the upcoming week to make sure there aren’t any overlaps. Well, sort of anyway. I’d like to introduce you to Homeschool Planet. It’s an online planner that almost deserves a galaxy all its own. Recently, Homeschool Planet invited me to try out their online planner and it is pretty impressive. I wish I had had access to this for all of our homeschool years. If you’re looking for an easy, flexible, full-featured online planner that doesn’t require hours to learn – just open the calendar and start adding classes, assignments, and appointments – then I think you’ll want to check out Homeschool Planet as you begin planning for the next school year. And now is a great time to do so. 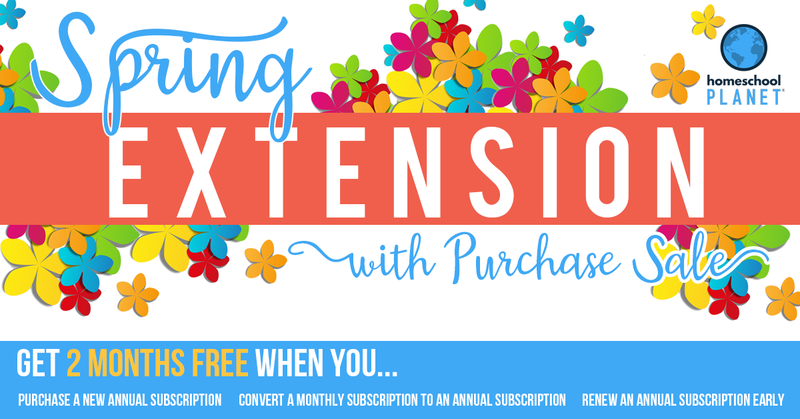 During the month of April, when you purchase a subscription to Homeschool Planet, you’ll receive an added 2 months FREE! Head on over and grab an annual subscription and you will automatically get 2 months FREE! Do you already have a subscription? No worries, renew early and you will qualify for 2 months FREE! Do you have a monthly subscription? No problem! Just convert your subscription to an annual plan and get 2 months FREE! No coupon necessary. ANY member or new member qualifies! Don’t miss out! This offer ends April 30th.